Having grown up a few steps away from the mighty Danube River, I have been fascinated by the appearance of river cruises on all European waterways in recent years. The elegant river cruise ships, the luxury decks with vacationers sipping cocktails or snapping photos of the beautiful scenery have become a familiar sight. And when the opportunity arose to spend a few days on Uniworld’s Rhine River Cruise, I could easily imagine myself in their place. Debarking from the lovely ship, we were soon off on a delightful tour of the city of Frankfurt. Although only about 1% of Frankfurt’s population is affiliated with the Jewish community, the city boasts a long list of sights related to its Jewish past and present. And there are more than 30 museums in Frankfurt, most of them located within walking distance, along the beautiful river promenade, next to and opposite of the cruise ship docks. Frankfurt’s Jewish community was already mentioned in a 1074 decree, and against all odds they were able to build and rebuild their synagogue – with a mikvah underneath - and to open a cemetery, which has been in use since the late 1100s! The cemetery is located next to the Judengasse Museum, in and above the former Jewish ghetto area, outside the medieval city walls. A 1980s excavation revealed the foundations of 19 long forgotten buildings, of which five can be seen here. It was a thrilling experience to be able to walk through these compact houses on our tour, and to experience life in the first ghetto of Europe. Next to the museum, the most famous grave of the cemetery is that of Mayer Amschel Rothschild, the founder of the banker dynasty. One of the 11,134 small tablets on the wall of the cemetery has a familiar name on it, that of a very well-known one-time Jewish resident of the city, Anne Frank. We were extremely lucky on our tour to be able to join a solemn occasion at the richly decorated blue and gold Westend Synagogue (1910). We heard a moving speech there, on the anniversary of the Night of the Broken Glass (9–10 November 1938) by the Mayor Peter Feldmann, who is also Jewish. Currently, the Frankfurt Jewish community is the second-largest in Germany, and the majestic synagogue, with its 1,000 seats has become a vibrant center of Jewish life. 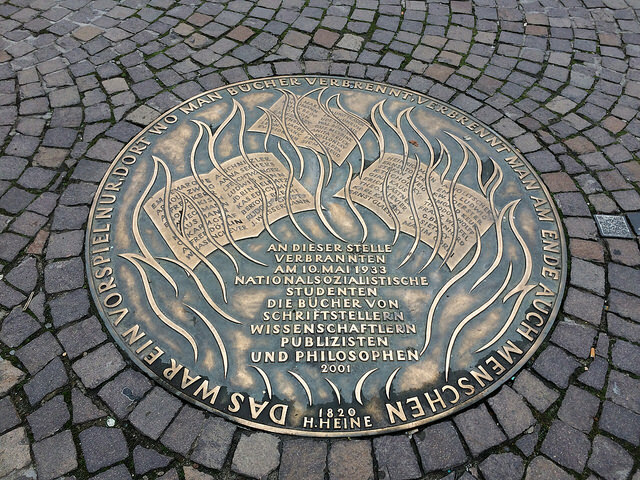 Our tour included the Book Burning Memorial on the Old Town’s main square, and the above-ground bunker – a civil defense bunker that was built in 1942 on the ruins of the city’s second largest Synagogue. The synagogue itself was destroyed in 1938, and the site now holds an exhibition about the one-time Jewish community. These somber reminders of the past prove how important it is to keep the memory alive and educate the next generations. Frankfurt, the fifth largest city in Germany, was once one of the most important cities of the Holy Roman Empire. Frankfurt is a global city now, the largest financial hub in Europe and home to some of the world’s largest trade fairs. Home to Europe’s tallest skyscrapers, several universities, and a world famous shopping area, Frankfurt is also known for its unusual culinary specialties, like “hand-cheese with music”, green sauce, and cider. With its central location near the crossing of the Main and Rhine rivers, it is a beloved river cruise ship destination. Book our river cruise excursions here: https://www.milkandhoneytours.com/jewish-shore-excursions!